Yesterday, in our on-going series on women in leadership roles in the church, we began looking at an argument often given by conservative complementarians when presented with the cultural context behind 1 Timothy, some of the most seemingly clear verses in scripture that limit a woman’s role in the church. Oftentimes, egalitarians offer the cultural context to show that these woman-limiting verses are in fact speaking to specific things going on at the time (as I did), rather than some eternal prohibition for all churches at all times. The conservative response that we began looking at is when they say that the cultural context is all well and fine, but Paul’s foundation for what he says does not appear to be the immediate context at the time, but rather the very structure of creation itself. We looked at those verses to try and argue that this is not at all what Paul is doing in the text. Today, I want to do something difficult. I want to look at Genesis itself to show how the exegesis of Genesis by “conservative Paul” (who here on out will be referred to as “Paul”–in quotes) would be wrong and irresponsible if this actually were what he was saying. What makes this so difficult is not only am I seemingly “challenging and disregarding the writings of an apostle” (in the minds of conservatives), but Paul has a very consistent habit of twisting, abusing, mistranslating, and editing parts of the Old Testament to fit whatever his purpose is in the moment. Indeed, the entire New Testament does this (in fact, I can’t think of a single Old Testament reference in the New Testament that is used in the same way that the original OT author would have intended). I can’t go into a full treatment of this subject, but I will say this: the New Testament’s (especially Paul’s) “abuse” of the Old Testament is (as far as I can recall right now) only ever done in light of something having to do with Jesus or the Gospel itself. Jesus is the hermeneutical filter for the entire Bible–original authorial intent be damned (it seems). So why am I going into this when talking about this topic? In short, the level I think “Paul” would have to twist and abuse Genesis to fit this argument against women in the Church is a level of twisting and abuse to which Paul and the other New Testament writers only go when it has to do with the Gospel itself or Jesus himself–not random ecclesiological statements. And so, I don’t think the traditional conservative view of 1 Timothy 2 does the Genesis story justice. And when I say this, I’m not saying Paul is wrong, but that the “conservative version” of Paul is doing terrible exegesis (or rather, complementarians are imposing terrible exegesis upon Paul). I don’t think Paul is doing this terrible exegesis, so I’m not attacking him. But “Paul”, on the other hand, is. As I’ve written about before, the creation stories in Genesis 1 and 2 use lots of architectural language later used to describe the constructions of the temple and tabernacle. In other words, the stories of creation are stories of Elohim building a temple for himself that he intends to dwell in forever. As was the custom for ancient temples, this God puts a garden around it, whose boundaries represent the boundaries of the temple and the King’s residence and rule. This God then ordains two priests–Adam and Eve–to care for this temple and extend its boundaries. The Chapter 1 account of creation does not mention the creation of Adam and Eve separately, but rather within the same creative act of God. Further, in this chapter, God ties the “gendered-ness” of humans to the very image of God–an image that is itself not hierarchical (see below). Also, in this chapter, both the man and woman are given equal authority and rule over creation, with neither having preference. And so, in Chapter 1, their “equality” is not only in identity (as conservatives want to say), but also function. “They” both receive the command to rule and reign. Not just the guy. There’s a reason why this chapter is first, and before Genesis 2 (where the specific Adam and Eve stuff in question goes down). In the early Jewish mindset, Chapter 1 holds interpretive priority over Chapter 2. Now hear me out a little. Think about it. Outside of the first five chapters of Genesis, one genealogy in Chronicles, and a passing allusion in Hosea, why is Adam not mentioned at all in the rest of the Old Testament? In the rest of Old Testament storytelling and interpretation of itself, Genesis 2 plays no part in the rest of the story. Genesis 1 is alluded to time and time again (especially in the Psalms). It really seems like the Hebrew mindset saw Genesis 1 as the story that is more woven into the fabric of our identity as the people of God. In light of this, in my mind, it makes it unlikely that Paul, a Jewish rabbi steeped in the traditions of Jewish interpretation, would suddenly be appealing to Genesis 2 as representative of the most-engrained aspects of gender relations, applicable to the modern church. It seems more likely to me that he is instead appealing to a couple of verses to address a specific heresy that has a direct bearing on those verses. (Side note: Paul talks of Adam and Adam’s sin in Romans because this is written about only in Chapter 2 of Genesis, whereas both Genesis 1 and 2 have accounts of gendered-creation. What I’m saying is that there seems to be an OT bias towards Chapter 1 in those things that are mentioned in both 1 and 2. It’s also of note that in the “Fall” account in Romans 1, neither Adam nor Eve are mentioned at all, and Paul only seems to bring up Adam in Chapter 5 so he can talk about the importance of Jesus–again seeing the OT being only as good as it can be used to point to Christ. Concerning this “Image” in which man and woman are made: is this Image schizophrenic and hierarchical? Some conservatives will start shouting yes! But wait. I’m not talking about the persons of God, but the image of God–we can talk about “submission” in the Godhead another time. 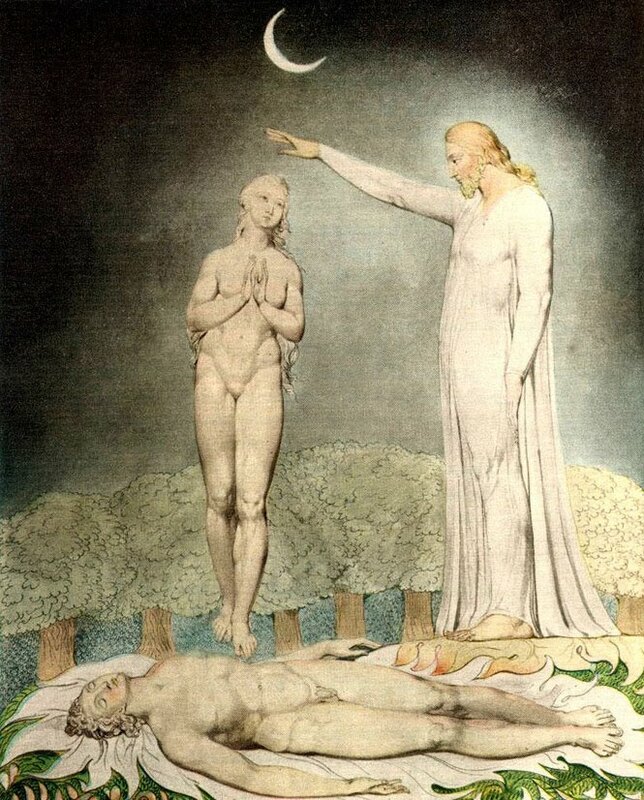 Neither Adam nor Eve is said to reflect or represent that image more than the other, in either value or function. Using this Image idea, I can’t imagine God (through Paul) saying, in essence, “I do not allow one part of my image to hold authority or teach another part of my image, because one part of my image was made first, then the other.” What? With this whole “Eve came out of Adam” thing, there is a Western bias at play that we can easily miss. We forget that Christianity (and Judaism) are not Western religions, but Eastern. And so, their storytelling is not so linear as to give this sort of hierarchical and chronological priority. Rather, Judaism is cyclical (see Ecclesiastes and Proverbs). Forgive how crude this might be, but Eve comes out of Adam, so that Adam can go into her, and make more humans (specifically two males) who come out of Eve. It’s supposed to picture the cycles and rhythms that God has woven into creation (rather than hierarchies). Relatedly, Woman comes out of the Man, but then the Man is commanded to leave his family and be joined to the Woman. Oddly, the Woman is not called to join herself to the man. So who’s the “authoritative” one in that part of the arrangement? Adam is never given the same call to authority over the woman that he’s given over everything else. Some conservatives would point to him naming Eve, and yes, that’s a compelling argument, I admit. But there are still a few responses I have. First, the naming of the animals is a call that Adam is given by God, and it’s explicitly linked to his authority and leadership over them. But he’s not called to name Eve, he just does. Second, he doesn’t really “name” her. Her name (in Hebrew) is “Havah” (Eve, meaning “giver of life”), but Adam doesn’t give her this name–he just calls her “Woman”. Lastly, Adam’s naming of Eve is never explicitly linked in the story to authority, but mainly to love (and not even “loving authority”, as some of you might try and say). It’s an expression of romantic poetry that many interpret as wedding vows. And one big, glaring detail here: according to Genesis, is authority even found in being the first chronologically? God makes the only creatures with authority, humankind, last. If there is any tie between authority and chronological order, the text can only support the idea that the last created being is the one in authority. So–one could argue–Eve’s being created after Adam does not imply his rulership over her, but could actually support the opposite. However, the only concrete statement that can be made about why any humans were given any authority is based upon their being made in God’s image; no connection is made between chronology and hierarchy. And lastly (and this should be obvious), if there is a priority in creation order, then…uh…Adam was one of the last things created. Why are humans given authority over everything created before them, but then Adam is given authority also over that which was created after him? I just don’t see it. Like I said, what makes this post difficult (and in the minds of some, completely irrelevant to the discussion) is that many would say that it doesn’t matter what Genesis itself says nearly as much as what “Paul” says. And, in a sense, I absolutely agree. If those verses in 1 Timothy hadn’t been translated and treated as they have been, then my words here would have much more weight. And so, as I go, I want to stress here that I’m not trying to pit Paul against Genesis, but rather “Paul” against Genesis. In other words, I’ve written this post, hoping to show that only an incorrect conservative caricature of Paul would look at the Genesis account like conservatives say he did. I know that ultimately, the crux of this particular discussion of that particular 1 Timothy text lies in the Timothy verses themselves and how Paul viewed them, rather than ancient Jewish treatment of Genesis. But I hope, in some way, that this post is helpful to the discussion nonetheless. I’m happy to have stumbled soon this, it’s really interesting, and something I haven’t been able to make since of.